She spreads her wing, and enjoys full sun on a bed of flowers! 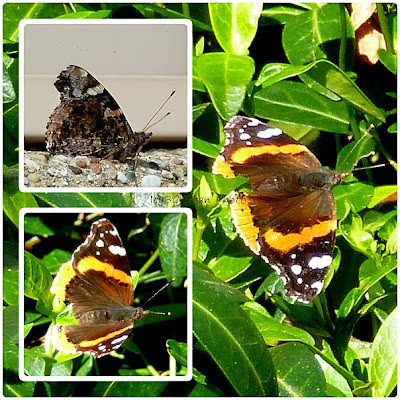 Like the white butterfly, which I couldn't identify just yet, there were lots of chasing and teasing going on, but this red admiral thought that she could fool me with a similar patterns and colors on the ledge of my window. She almost blended in with this surrounding! I believe I captured the same kind of butterfly on my lilac bush! Oh neat is that?! Great shots...I haven't seen any butterflies yet...I think it is a bit too chilly. Maybe Jo has them all at the Botanical Garden! You did a good job chasing and shooting! love seeing butterflies, bringing so much joy around. i can relate to the exhaustion chasing them :) haha, but you got some really great ones. They can be very difficult to capture. You did wonderfully! Thank you for sharing at YSB this week, dear! Butterflies don't seem to realize that we want to capture them only with our cameras, not our nets. It is not easy to capture butterflies, you did well! There were many butterflies this april, hope also for the summer for more photos. Hi Icy, I don't know if it's just my server, but Beyond Zephyr is taking a long time to load for me today. You know I love butterflies. This one is amazing. Nice! We have quite a few up here in New England this year. And Question Marks, too. I've never seen so many.